Given Toronto FC's up-and-down season, perhaps it's no surprise that the team's flight home from San Francisco was cancelled Sunday. The team had been scheduled to land in Toronto at 8:30 p.m. local time. Instead, due to mechanical issues, it got home at 6:30 Monday morning after taking the red-eye following a disappointing 1-1 draw Saturday night with the league-worst San Jose Earthquakes. "Even the plane got hurt," quipped star striker Sebastian Giovinco, who is nursing a groin issue himself. Time is running out for the defending MLS champions, who sit nine points out of a playoff spot with 10 games remaining. Injuries, a brutal schedule and costly errors have made for a death by a thousand cuts. Toronto (6-12-6) has a crucial game Saturday with visiting Montreal (10-13-3), which currently occupies the sixth and last playoff spot in the Eastern Conference. The flight from hell — the team got rooms at a nearby airport hotel to kill time with some players opting to act tourist in San Francisco — capped a two-week five-game stretch that saw TFC visit Atlanta, Vancouver and San Jose. The marathon continues. After hosting Montreal, ninth-place Toronto heads back west for a midweek game in Portland. 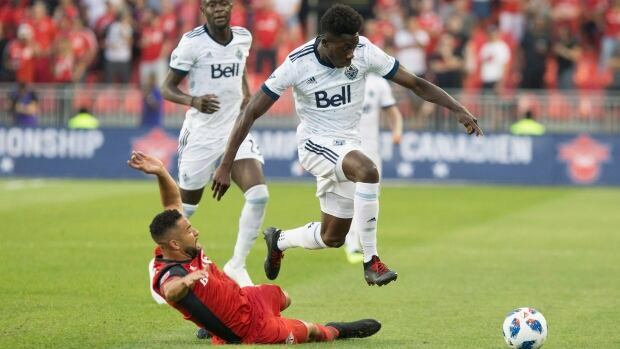 "You're trying to win these games — they're vital for us to win — but you're also trying to get guys out of it healthy … It's been challenging for sure from a scheduling standpoint," said coach Greg Vanney. In San Jose, Toronto was without Spanish playmaker Victor Vazquez (knee) and Brazilian wingback Auro (hamstring). Defender Eriq Zavaleta (hamstring) made the trip but was deemed too "tender" to include in the matchday 18. A sore Giovinco came off the bench. Striker Jozy Altidore and defender Chris Mavinga were self-inflicted injuries, suspended after red cards. Facing a Quakes team that ranks 18th in the league in goals-against at 1.83 a game, Toronto was outshot 18-8 (5-1 in shots on target). The stat makes more sense when you realize that Toronto stands 19th in goals-against, at 1.88 conceded per game. On the plus side, it took less than two minutes for Toronto to find the back of the net after Giovinco and Gregory van der Wiel were introduced in the 58th minute. Six passes after fullback Nick Hagglund dispossessed a San Jose player on a throw-in, Argentine newcomer Lucas Jansson capped a seemingly effortless attack with a tap-in for his first goal in TFC colours. But for every step forward this season, there has been a step back for Toronto. In the 77th minute, a Hagglund pass found a Quake player inside the San Jose half. With Hagglund now out of position, a pass deep into the Toronto end found Chris Wondolowski racing in alone. Goalkeeper Alex Bono bobbled his relatively tame shot and Wondolowski beat Jason Hernandez to the ball for the tying goal. The two faces of TFC were there to see in one eight-minute stretch. Flashes of brilliance matched by mistake on mistake on mistake. Vanney is about as well-adjusted and even-keeled as they come. But even his beacon of positivity seems to be burning low in a season that would leave Tony Robbins hard-pressed to find light at the end of the tunnel. Toronto has not beaten a team other than Chicago, which stands second last in the standings, since June 8 (a 2-5-4 run) in league play. Of Toronto's 10 remaining games, six are at home (Montreal, Los Angeles FC, Los Angeles Galaxy, New England Revolution, Vancouver and Atlanta) and four on the road (Portland, New York Red Bulls, D.C. United and Montreal). Of those opponents, only D.C. United and New England are currently out of the playoff picture and they sit above Toronto in the Eastern standings. "I don't think we need to win 10 games to get ourselves into the playoffs," Vanney said Tuesday. "I still think the minimum number is probably seven that we've got to win. There's your margin right there. It's slim. Very slim." In truth it was slim a month ago. We have now gone well beyond supermodel-slim. Toronto FC coach Greg Vanney says despite a recent report of European interest in striker Jozy Altidore, the MLS club has not received any offers. "I am not the least bit surprised that clubs around the world are interested in Jozy. But to be interested and to actually approach us and to make an offer is another step," Vanney said when asked Tuesday about the reports. "I want Jozy here. I think everybody wants Jozy here. We've seen the value of Jozy to us. So for me, it's not even a discussion." General manager Tim Bezbatchenko echoed Vanney. "We have not received anything from a club as of late, but clubs are regularly interested in Jozy and other players," he said in a text to The Canadian Press. While the 28-year-old U.S. international missed a large chunk of this season due to foot surgery, a healthy Altidore has proved to be hard to stop with 48 goals in 93 regular-season and playoff games for TFC. The transfer window has already closed in some European countries with others counting down the days. After leaving the MLS MetroStars (now New York Red Bulls) in 2008, Altidore played for Spain's Villarreal, England's Hull City and Sunderland, Turkey's Buraspor and the Netherlands' AZ Alkmaar before joining Toronto prior to the 2015 season.